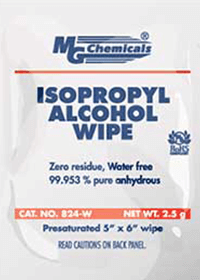 Handy general purpose cloth type wipes pre-saturated with 99.95% isopropyl alcohol. Made from a blend of polyester and woodpulp they are strong and durable. Each wipe is wrapped and sealed individually to prevent solution evaporation and maintain its full effectiveness. Ideal format for field repair & maintenance work.